Lease problems can get a landlord into hot water when it comes time to enforce their rights. Make certain your lease will protect you when you need it. One of the common problems that landlords face is a lease agreement that leaves too much to the imagination. While very simple language is highly effective, the lease can’t be short on details about both sides’ rights and responsibilities. Some generic lease forms have more fill-in-the-blank spaces than text, and that can be a problem because it’s hard to decipher what information needs to go in those blanks. Avoid leases that you may have used for a property in a different locale. A lease needs to be tailored to the local rules, and the template should be reviewed by a local attorney. Make sure you have read the lease in its entirety, and that the meaning of each provision is clear. Don’t take something out if you don’t understand its purpose for being there in the first place. Always keep a clean copy of the template, even if you modify the lease for a specific tenant. While the signed lease will likely control if there is a dispute, some promises made during negotiation can still serve as an escape route for tenants who want to bolt. For example, if you advertise that the building has security, but later scale down the security guard’s hours, the tenant can argue that they relied on those earlier statements when signing the lease. Technology makes it so easy to communicate, but sometimes it trips us up. If you have been emailing back and forth with the applicant rather than meeting in person, not only do you miss an important opportunity to catch discrepancies helpful for tenant screening, but you may end up with an emailed version of the lease. 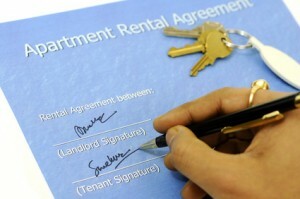 You could have a hard time pursuing the tenant for breaching the lease if you cannot produce a signed copy. Software and printers can drop sections or pages of the original lease, or automatically change it when you go back to recover it. And just because your filing system is on the computer doesn’t mean it is organized. Always keep a template of your proper lease, and work from that each time. That way, if you modify the agreement for one tenant, you won’t continue to include those new terms each time. Most written leases contain a modification clause that requires any changes be in writing. Don’t violate that rule through actions or statements that amend the lease–not even one time. Once a lease is signed, many tenants don’t keep a copy handy. That means they may not remember all the terms and conditions– or even the landlord’s phone number. Consider handing out business cards or refrigerator magnets with phone numbers, and a laminated “rules” sheets. Post signs, send emails, or keep a bulletin board. It can take a busy adult a number of repetitions before they commit something to memory. Help the tenant keep their promises by reminding them what is expected of them.